I remember when I first heard of manatees. It was sometime in elementary school, when we were talking about endangered species and what that meant. I was more concerned about the gray wolves (and would go on to be obsessed with them for a few years before I hit my horse phase in middle school), but I remember thinking manatees sounded pretty cool, too. Manatees are herbivores and spend pretty much all their waking hours eating. They are coastal dwellers, and can survive in both fresh and salt water (but they can't pressurize their ears, meaning you'll never find them down very deep). Manatees breathe about once every 3 minutes (or up to once every 5-6 minutes if they are sleeping/resting). Manatees evolved from land mammals (and are related to elephants), and still have small fingernails on their front flippers! 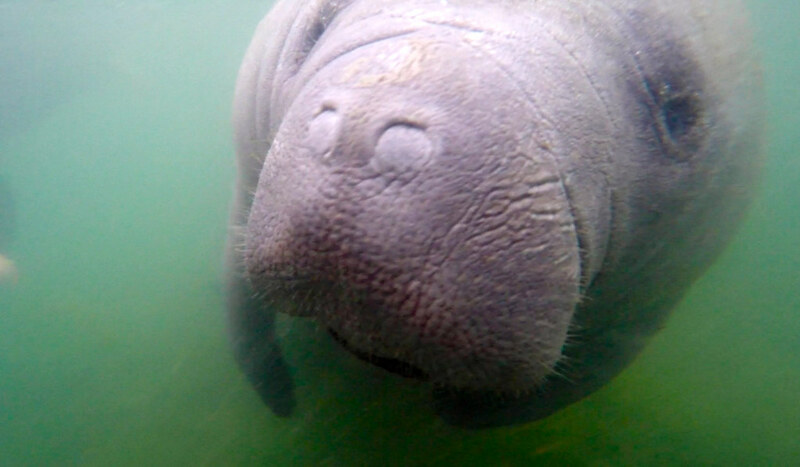 Early explorers like Christopher Columbus thought manatees were mermaids. Manatees usually move quite slowly, but can swim up to 25 miles per hour in a burst if they are spooked. They can live into their 60s, though many in the wild don't live to be that old. Manatees have no natural predators to be afraid of, making them fairly curious creatures. They cannot survive well in water cooler than about 60 degrees — and prefer it to be much warmer than that. This last fact means that, during the winter months, the manatees that call the waters in and around the Gulf of Mexico home often have to seek warmer spots if they want to survive. Because, even though most people associate places like Florida and Alabama with hot, tropical weather, the reality is that it can get quite chilly there during the winter — especially at night. 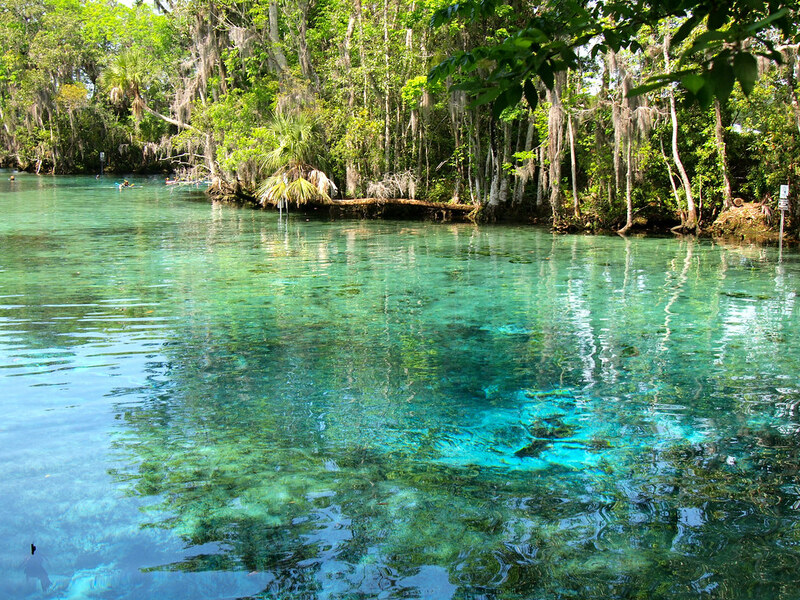 Hence why the natural springs around Crystal River, Florida, are jam-packed with manatees each and every winter. During the cold months, this spring is FILLED with manatees. 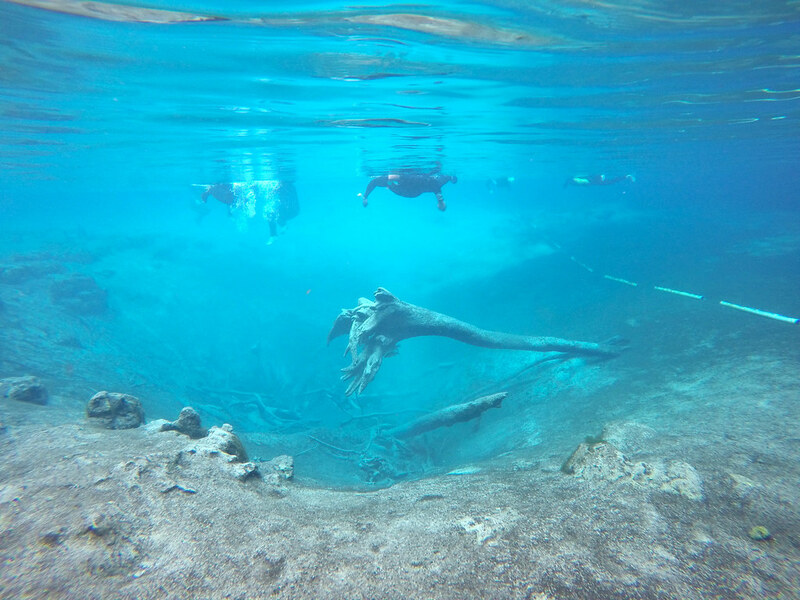 With so many manatees in the area (especially during the colder months), manatee snorkeling tours have become increasingly popular in Crystal River. And, after having swum recently with dolphins and fur seals, I figured I may as well add manatees to my list! I was staying at The Plantation on Crystal River (a beautiful historic hotel right on the canal), and the hotel has its own dive shop/marina right on site. And they, of course, do manatee tours. I showed up at 6:30 a.m. while it was still dark and climbed into a 5mm wetsuit (not an easy feat). I then watched a manatee safety video with my 10 tour mates before climbing into a boat in the fog with Captain Ed. The video stressed the importance of “passive observation” — the ideal way to interact with any sort of wildlife. In the case of swimming with manatees, this means not chasing the animals or approaching them in any way. Basically (much like when I swam with fur seals in New Zealand), you're told to lay still in the water and let the manatees come to you. Because, while the video stresses that you shouldn't poke, prod, step on, or otherwise touch the wild manatees at all, the animals have not had the same “passive observation” briefing. This was made evident as soon as we got in the water just around the corner from the Plantation. 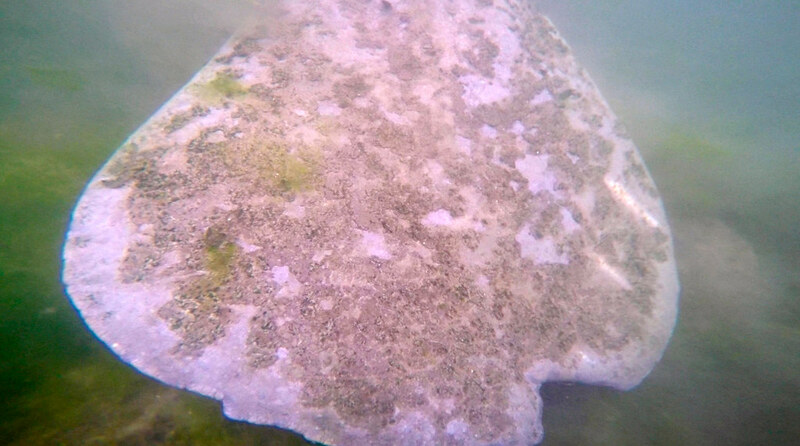 It was not guaranteed that we were going to see any manatees at all since the Florida weather had warmed up a lot in late March and the manatees had already left the springs dotted throughout King's Bay. But we found two resident manatees hanging out around the docks — a mother named V and her two-year-old calf. Captain Ed got in the water first to confirm that the manatees were going to stick around. The animals have terrible eyesight, but they make up for it with other senses — they know you're in the water once you get within about 10 feet of them. Ed soon motioned us all in, and we doggy-paddled/floated over in the direction of the manatees. What I saw when I got there was incredible — the baby manatee (which Ed later told us that he's known since it was born) swam right up to Ed and gave him a hug. And I'm not just saying that — the manatee literally swam up, grabbed Ed's arm with his flippers, and pulled the captain in for a snuggle. Then manatee the rolled over in the water, begging for belly rubs. We stayed with V and her baby for nearly an hour, floating around with big grins on our faces and watching as the manatees ate, came up for air, and generally just went about their everyday lives. Other than the first greeting the baby gave Captain Ed, the manatees seemed perfectly content to ignore us — V even pushed a couple of us out of the way when she wanted to munch on a different spot of vegetation. It was pretty cool to be so close to these gentle giants — and that's really what they are. They don't have teeth except molars for grinding, and yet they can grow up to about 13 feet long, and can easily weigh up to 1,200 pounds. V was at least 10 feet long, and Ed said she was probably somewhere in her 40s. 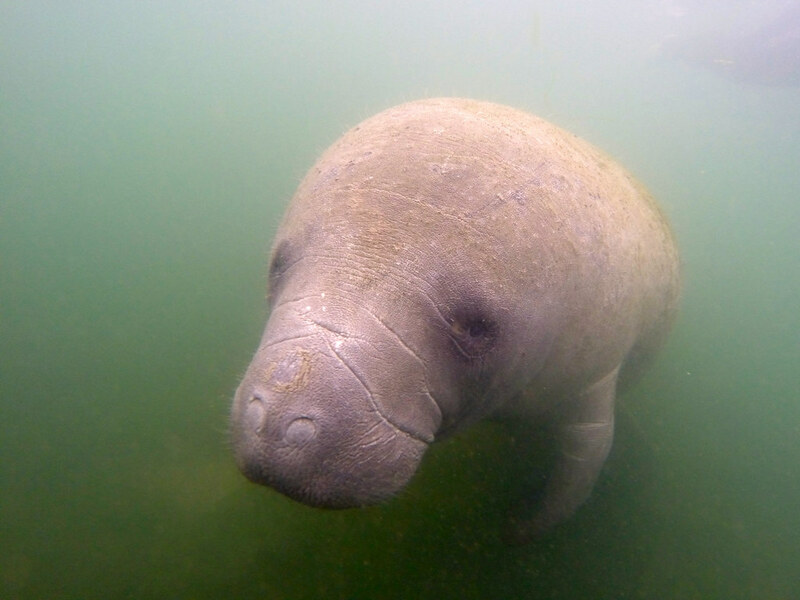 She's one of the “resident” manatees in Crystal River, meaning she often hangs out in the canals and nearby waterways, even when she doesn't need the warm water. You can see how big V is! Soon a few other boats came by to visit the manatees, so our group packed up and headed to our next stop: Three Sisters Springs. In the really cold months, it's here at Three Sisters that hundreds upon hundreds of manatees gather. During “manatee season” (generally mid-November to late March), areas are roped off for the manatees, and boats are not allowed in the area. Unfortunately there were no manatees left in Three Sisters when I was there — but it was still SO worth a visit. The water was crystal clear and tinted a beautiful blue color, and it was neat to be able to float over the natural springs. If I were a manatee, I would totally want to spend the winter here. As it was, we were the first tour group into the springs, meaning we had plenty of time to swim around and enjoy it. I'm determined to come back next year, though, when there will be some manatees around! Should you swim with manatees? Before going on this tour, I definitely wrestled with the “Is it responsible?” question that I always face whenever any sort of animal “encounter” is involved. So many animal-related tours out there do more harm than good to the animals. 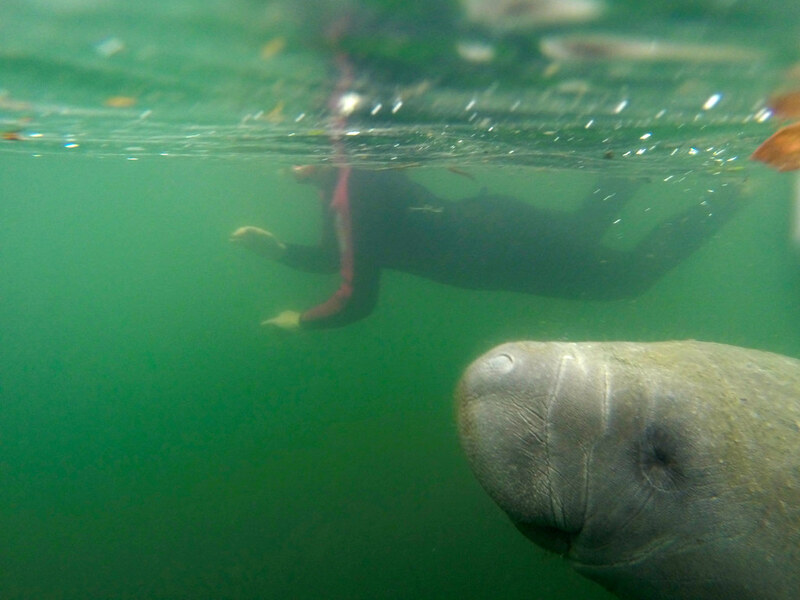 And, indeed, manatee tourism in and around Crystal River is not without its controversy. As I mentioned earlier, manatees have no natural predators and are very curious creatures. This can be both good and bad. It's great for people who want to have a manatee encounter. But it's not always great for the manatees. First of all, their curiosity, slow pace, and tendency to be hanging out near the water's surface means that many manatees have unfortunate run-ins with boats every year. And, with more and more people moving to coastal regions and manatee tourism increasing, this only means more boats. V, for example, got her name from the notch in her tail. Boat-related deaths account for about 20 percent of all manatee deaths each year, and more manatees die from human-related activity like getting caught in fishing nets/line and drowning, or eating rubbish that's been thrown into the water and getting sick (they aren't like sharks; they don't take a “test” bite of potential food — they eat first and ask questions later). So of course I had to do my research before participating in any sort of . 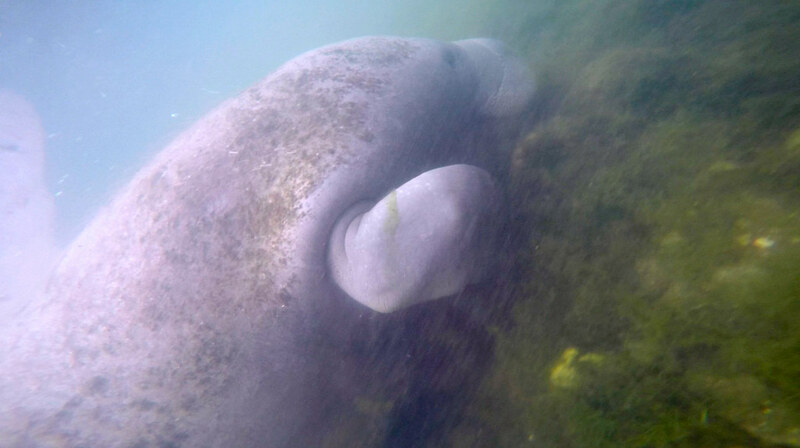 Luckily, all the tour companies in Crystal River are strictly regulated, volunteers police the manatee sanctuaries when they're full, and visitors are always encouraged to practice passive observation. Plus, I'm a firm believer that once you have an experience like this, you automatically become somewhat of an advocate for the animals. And the good news is that the increase in manatee tourism hasn't hurt the manatees whatsoever. In fact, Florida counted a record number of manatees in 2014 — over 6,000 of them! Florida's manatees may also be taken off the endangered list soon and re-classified as “threatened.” Which is definitely good news. I loved my morning with the manatees, and am already plotting my return trip next winter! 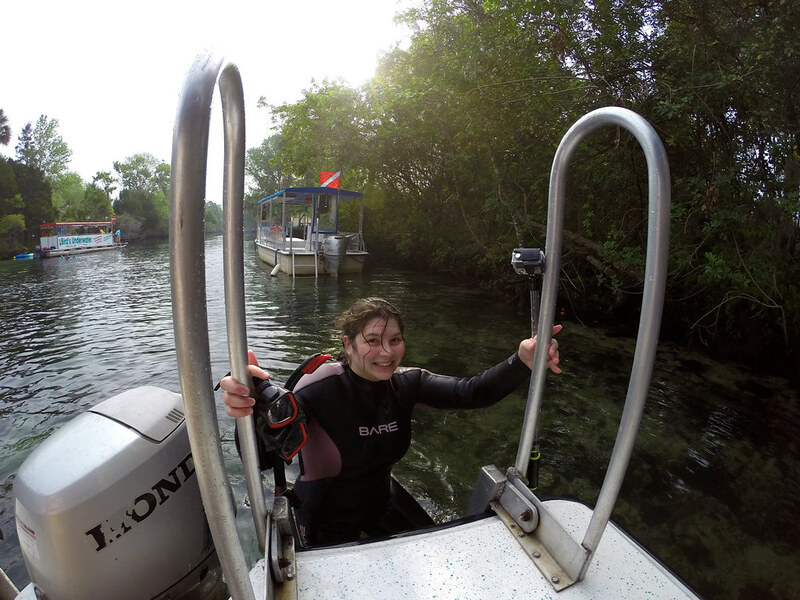 I went on a manatee snorkel tour through The Plantation on Crystal River. Tours last about 3.5 hours and cost $55 per person. The price includes a 5mm wetsuit, mask and snorkel, a dry towel, and coffee/hot chocolate on the boat. 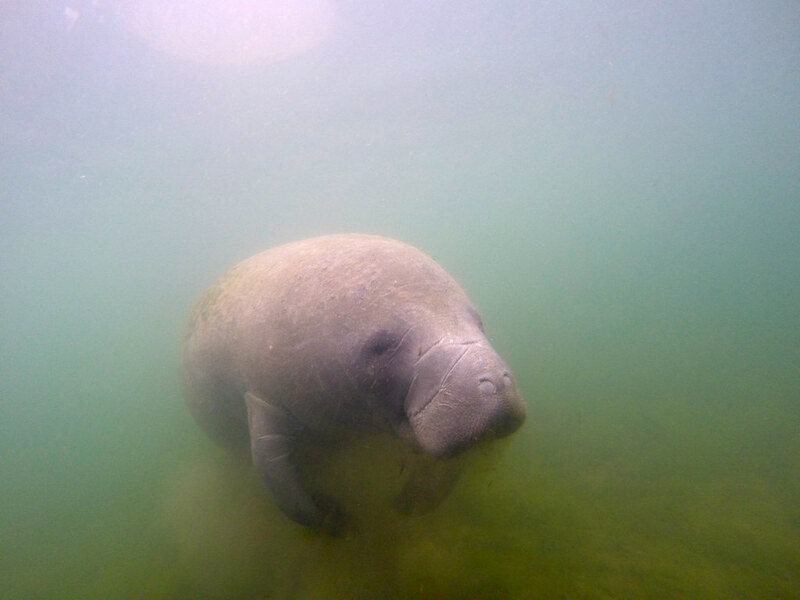 Tip: If you go outside of “manatee season,” go on a tour as early in the morning as you can, as you have a better chance of seeing some local “resident” manatees earlier in the morning. Or check out a instead. Would YOU want to swim with manatees? *Note: I was a guest of the Plantation on Crystal River, and received a complimentary manatee swimming tour. As always, though, all opinions are 100% my own. Wow. Sounds like an amazing day!!! Crystal River has been on my list for a while- hope to check it off soon! Crystal River is amazing – I really fell in love with it. I’m already planning to go back again next winter! Thank you, Akatuki, for your great post. Manatees are endangered. I support a Ric O’Barry Foundation (saving the dolphins) and Sea Shepherd. Most of these foundations argue against “Swim with the Dolphins” program and SeaWorld. Swimming with the manatees is a little different. 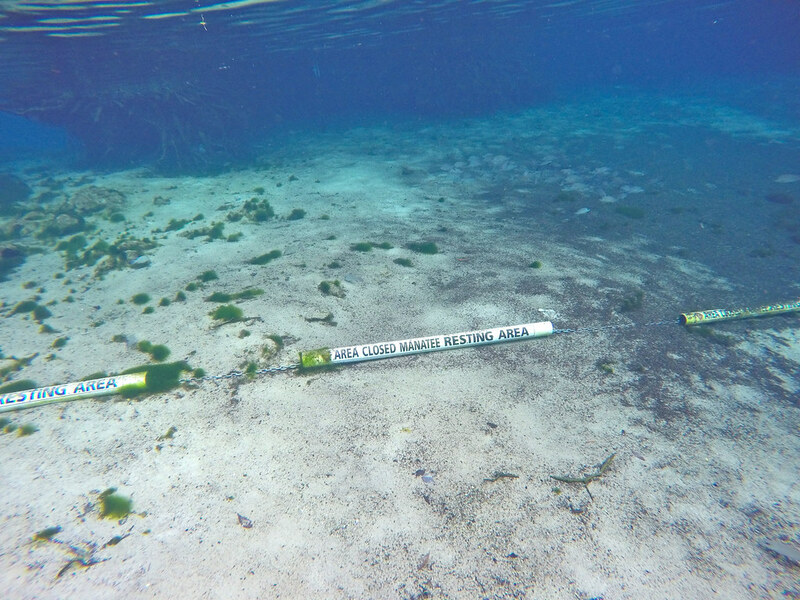 It allows people to support the NPR in their efforts to manage and increase manatee populations. There has been evidence that there is a positive correlation between increase in tourism and increasing populations of manatees. Tourism has actually been beneficial for manatees due to bringing awareness and legislation. I really don’t see a problem with swimming with manatees. I know the locals complain that they have to drive their boats slower so they don’t hit a manatee. Cry me a river… Slow the boat down for the no wake zone, and appreciate the wildlife. I hope someday I get to try this endeavour. It’s definitely on my bucket list. I don’t support SeaWorld at all, but I DO try to seek out responsible tours like this with marine life around the world. Some places really do get it and make the experience great for both the people and the animals. 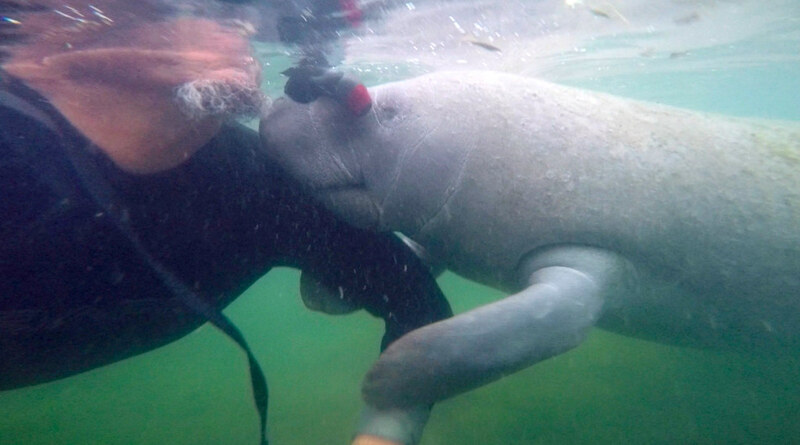 But I’m with you – I don’t think the tourism poses a risk to the manatees at all. In fact, it’s probably saving them because the locals now realize that the manatees are their main tourism draw, and most of them want to make sure to protect them! It’s so awesome to hear about responsible wildlife tours that still let you get so close to the animals! And let’s be real, manatee snuggles have got to be on the list of greatest snuggles in the world. Gonna go ahead and add this to my list! 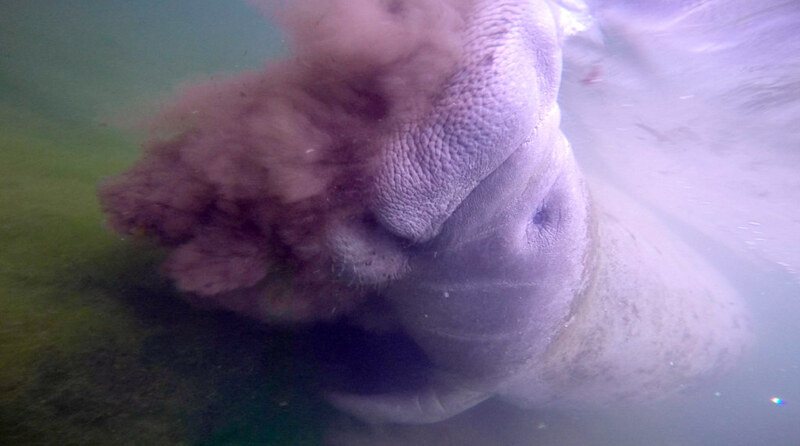 Umm, yes, watching that manatee snuggle our captain absolutely melted my heart! There are still many people who would like to see the swimming tours stopped (and just stick to boat/kayaking tours), but after going on one I really do think they do a good job of educating people. I’m glad I did it! So glad you got to see manatees! If you do go again next winter let me know and maybe we could do it together. I have family up there and wanted to do the snorkeling this year but it never worked out. I’m glad we got to see some, too! I was definitely worried that it was getting too warm for them, but I lucked out! I’ve already told my boyfriend we’re going down next year in late January or early February! So if you’re around, let me know! Wow, Akatuki. You swim with all sorts of things – kind of makes me want to learn how to swim (yes, I don’t know how!). Manatees seem very interesting and sounds like a wonderful opportunity! Haha, yes, I’ve kind of made it a mission to swim with as many cool things as possible! Manatees are definitely up there as some of my favorites. They’re so CUTE! Look like you still had some luck Akatuki; love the Manatee cuddles! Yes, definitely still had some luck! 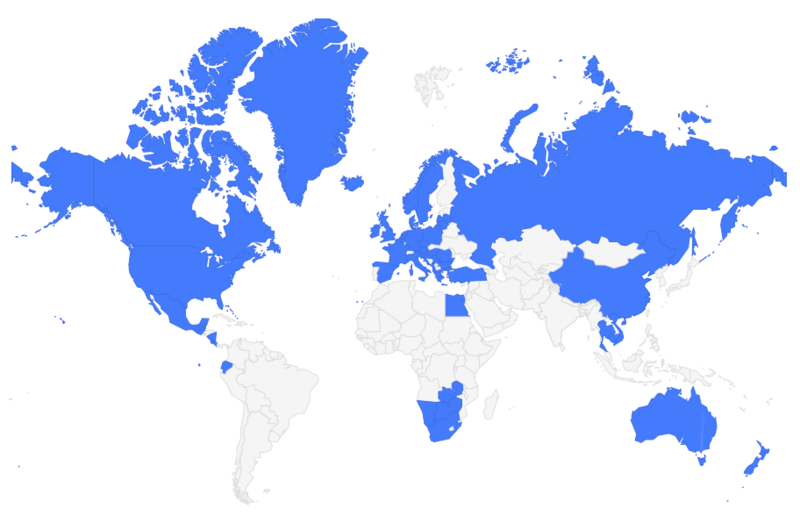 Judging by how many people want to come with me next year, maybe I’ll have to put a trip together! Haha. An amazing experience, but Akatuki, I believe your best part of the message is to do your research first and ask yourself the hard questions. Definitely. Especially if it involves animals or people that could be easily exploited. Thankfully I felt that this experience was a positive one! Oh my god, that is sooooo cute. 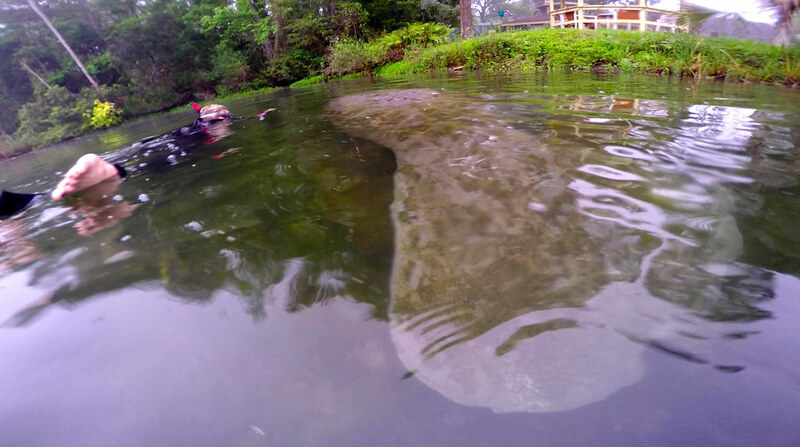 I knew of the Florida Manatees before, but it’s always amazing to read reports and see the photos. I hope to go there myself next winter. Manatees are probably the cutest animals I’ve ever seen. They are ridiculously adorable. From above, they just look like giant floating potatoes! I love them. I swam with the manatees about 3 years ago and unlike you, was really underwhelmed. By their nature, they are sedentary creatures so even though I saw a ton of manatees, very few of them were swimming. Obviously in nature there are no guarantees on any type of wildlife activity, but I think it’s just as likely you’d end up watching the resting manatees as you would be getting baby manatee hugs. We were in the area anyway, but I’m not sure I would go out of my way to plan a trip there. Sorry to hear that! I’m pretty sure I would have been just as excited to see a bunch of resting manatees, though. But that’s just me! I love these creatures so much. This is now going on my Bucket list! It’s a great item to have on there! I had a super lucky day at Three Sisters when I went three years ago (gosh, was that THREE years already?). It was packed with manatees and they were amazing! Manatees were my own childhood obsession — I started a fundraiser for my fourth grade class to adopt one — and so it was a dream come true for me. Florida is so cool! Florida IS so cool. So much more than just theme parks if you take the time to explore a bit! I loved Crystal River a lot and definitely know this won’t be my last trip there! I remember visiting my parents in Florida years ago and having them take me down to the manatee area…where we unfortunately missed the manatees by literally ONE day! I’ve never been able to get back down there at the right time of year again. I “adopted” a manatee at that time (who subsequently died, and I ended up “adopting” her son–yeah, a lot of years have passed since then). Anyway, I finally got to see a manatee in, of all places, Ohio!…when I made Tim take a big detour from wherever we were going at that time to go though Columbus so I could see them at the zoo there. Definitely not the same as your great trip! This has seriously been in my bucket list for a loooooooooong time. Aww bummer! I missed the hundreds of manatees by probably a week and was really sad. BUT, that’s just a reason to go back again next year! If you ever get a chance to go down there in the winter, I would definitely do it! Haha I love the floating potatoes image! And yes, the tour companies and volunteers who work at the Springs are really focused on making sure visitors are educated. 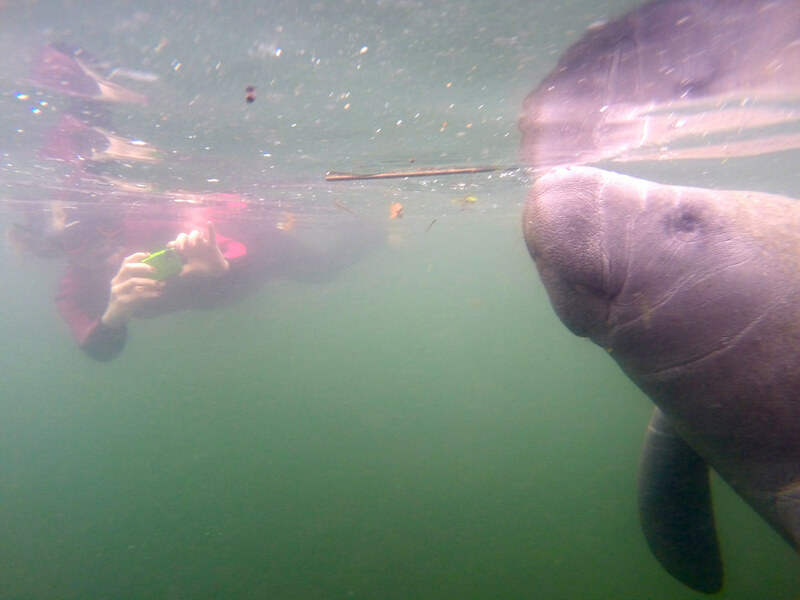 You of course are always going to have people who won’t follow the rules, but I think it’s still probably the most responsible way to get close to the manatees (and learn something in the process!). This looks like so much fun! I’ve never seen manatees before – they look so funny. They do! I loved watching them eat – their noses/mouths are so funny! Almost like a mini elephant trunk! I’ve always wanted to do this. When my grandfather retired he became a ranger and worked at a park in Florida. They have a little log cabin there when you cook your own breakfast on skillets and watch the manatees. It was an amazing experience, but not as amazing as swimming with them! Still sounds pretty great, though! But yeah, swimming with them was so fun! Thanks so much! I’m definitely a firm believer that travel bloggers have a great platform from which to educate others, so I try to do that whenever I can (and especially when it comes to potentially touchy subjects like animal tourism!). This is a really compelling article. In Thailand we have Dugong (พะยูน), which are from the same order Sirenia as 3 species of manatees, but the Dugong are extremely rare these days. Crystal River is fresh water, right? Here we would also be worried about getting some kind of parasite after being in freshwater for so long! Haha. Thanks for sharing na kha. Yes, I’ve heard of the dugong, though I’ve of course never seen one. Crystal River IS fresh water, but manatees can also live in brackish and salt water! Thanks for being so informative, Akatuki! I admit I had my suspicious when you said you were going to swim with manatees, but I’m not surprised that they were unfounded! I’m glad there are strict regulations and plenty of caring volunteers to make sure these sweet animals stay safe and respected. All of these pictures had me smiling- I hope to meet some manatees myself some day! Some of the volunteers are suuuuuper passionate – to the point where they yell at people a lot. Haha. Perhaps a little *too* passionate at times. But it’s great to know that the manatees have so many local advocates! You must have seen so many in January! This is definitely something I plan to do again someday. Simply amazing creatures … more needs to be done to ensure their safety…! I have swim with dolphins and sharks but never manatees! It was definitely fun! I’d love to do it again when there are hundreds around! They’re such cool animals. I did this a couple years ago and had a blast! It was an unseasonable warm day, so there were only a handful of manatees, but it was still so fun! I also did the dive into King’s Spring cave, which I didn’t particularly love… it was so dark and confined and silty! I’ll stick with the beautiful clear water! I’m hoping to go back and do it again next year when there are lots of manatees. It was so fun! Laura, unfortunately King’s Spring is no longer a great dive site on a regular basis due to the silt, and small entrance. 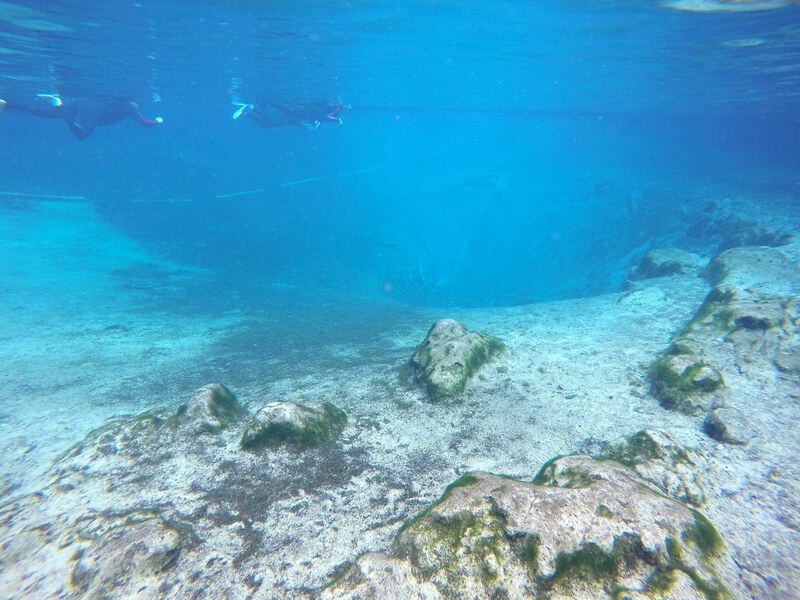 However if you ever come back to Crystal River to visit the manatees again- take an afternoon and drift dive down the Rainbow River, or check out Devil’s Den and/or Blue Grotto. 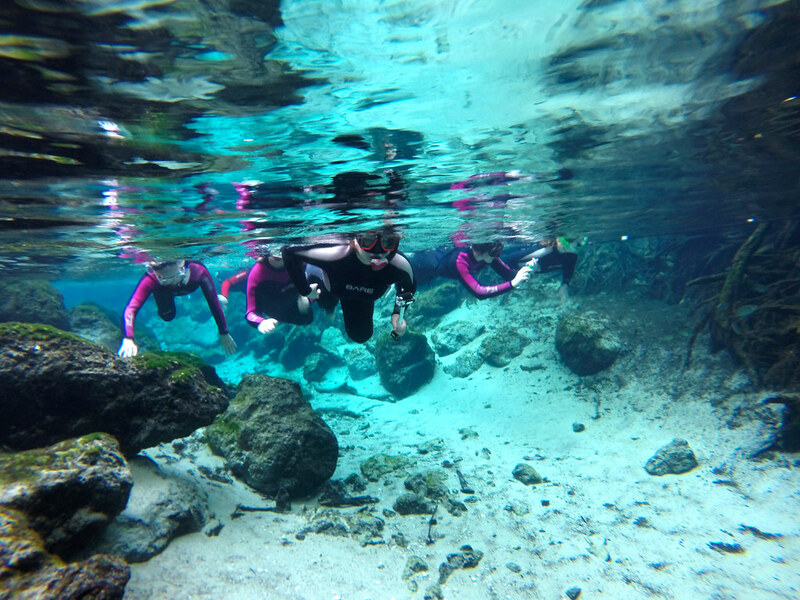 All are fairly close to Crystal River and offer great diving in clear, fresh water. Ahhh this is wonderful! Putting this on my to-do list. Thank you! Thanks for the article & pics! I’m glad to hear it is regulated for the safety of the manatees. Going with my wife & daughters in a week & can’t wait. I hope you see some manatees, Hank! I think things are going to be even more regulated this year – but it’s all for the good of the animals! 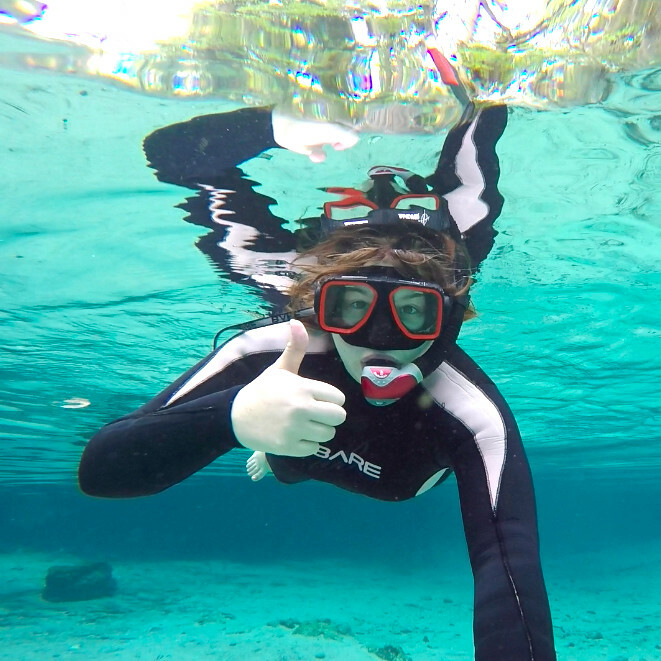 Your two blogs on Crystal River/swimming with manatees has been extremely helpful! I’ve wanted to see one in person since I was in 4th grade when we “adopted” one. Here I am 28 years old and finally getting a chance to, and especially a near by beach (go to florida= must put toes in sand). All your information was helpful from where to stay, what to do outside of manatees. I cannot wait to travel there for my 2 year anniversary. Thank you so much! You’re so welcome, Jessica! I’m glad you found these posts so helpful – and I hope you have an amazing time in Crystal River! I was swimming in the Gulf-1st time to penesila Florida ever – when I was floating letting the waves toss me up and down when I saw this dark shadow in the water -which I thought was seaweed. I did not want to be covered in it so I started to move out of its path. It then stuck its head out of the water and snorted at me. I was really freaked out and started doing my best to run away not knowing for sure what it was. I then realised it was a manatee which I had seen one at the aquarium the day before. It was one of those few really thrilling moments in life. He kept popping up around us for the next several minutes and even swam between my wife and I and brushed up against us a few times. This was truly such an awesome experience. I remember as I was watching the manatees in the tank at the aquarium the day before thinking how cool it would be to be able to get in the tank with them and swim and this happened the very next day. Totally AWESOME!!! Wow what an amazing encounter!! They’re such curious creatures! Are there any threat from alligators while swimming with the manatees in the Crystal river Akatuki?